Meanwhile, add bacon to a medium saute pan. Cook over medium-high heat, stirring occasionally, until crispy. Remove the bacon with a slotted spoon and set aside. Add asparagus to the pan and saute in the bacon grease for about 5-6 minutes, stirring occasionally, until cooked. Remove asparagus with a slotted spoon, and set aside with the bacon. Slowly add the white wine to the pan, and scape the bottom of the pan with a spoon to deglaze the pan and pick up all of those yummy brown bits. Continue cooking for 5 minutes, or until the wine has reduced by about half. When the pasta is cooked, drain it. 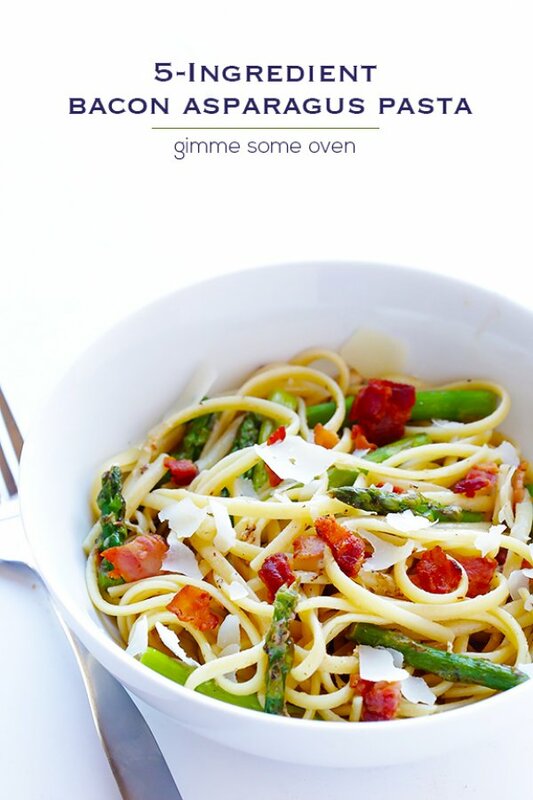 Then add the pasta, asparagus, bacon and 1/4 cup Parmesan cheese to the saute pan, and toss until combined. Sprinkle pasta with the remaining Parmesan cheese and serve immediately.